Coal mining is causing immense suffering to Adivasis in Chhattisgarh, Odisha. Why aren't we troubled? Chhattisgarh, Jharkhand, Odisha have 70% of India's coal. How does mining affect 2.60 crore Adivasis there? Coal remains the centrepiece of India's energy policy. India is the world's third largest producer as well as consumer of coal, using the fossil fuel to generate nearly two-thirds of its electricity. 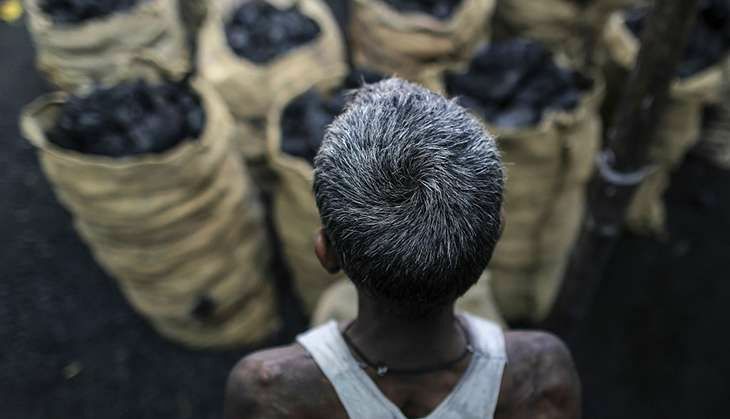 While the Narendra Modi regime is increasingly talking about renewable sources of energy - partly to meet the international obligations on carbon emission targets - it has set a target of doubling annual coal production by 2020. There is, however, a dark side to the attempts being made to cast India's growth story in black gold. Neither the Centre nor states are keen to take crores of people into confidence before digging up their land to extract coal. These are people who are at risk of losing their land, livelihoods and homes due to coal mining; around 90% of them are poor Adivasis, who can't figure out whether to curse their destiny or the apathetic state. Over 70% of India's coal reserves are in Chhattisgarh, Jharkhand and Odisha, which account for nearly 2.60 crores Adivasis, or 25% of the country's tribal population. Vast numbers of these tribals are already under existential threat due to indiscriminate mining over the past six decades or so. Coal India, the world's largest coal production company, has devised an aggressive policy to reach its annual production target of a billion tonnes. Three of Coal India's subsidiaries - South Eastern Coalfields Ltd (SECL), Central Coalfields Ltd (CCL) and Mahanadi Coalfields Limited (MCL) - are rapidly expanding their mining areas in Chhattisgarh, Jharkhand and Odisha. In the frenzy, the land acquisition laws and environmental guidelines are the first casualties. SECL operates the Kusmunda mine in Chhattisgarh while CCL extracts coal from Jharkhand's Tetrikhar mines. MCL operates Odisha's Vasundhara West mine. A survey conducted between January 2014 and June 2016 by Amnesty International found that Adivasi populations at none of these places had been asked before the land was acquired for mining. And most of them had to wait for decades for compensation and rehabilitation. According to the survey, information regarding claims, objections and public hearings either did not reach the affected people at all, or arrived too late. The authorities did not even try to disseminate the information by any means other than newspapers even though most Adivasis were illiterate. The development of coal mines is chiefly governed by four laws - Coal Bearing Areas (Acquisition and Development) Act, 1957; Environment (Protection) Act, 1986; Panchayats (Extension to Scheduled Areas) Act, 1996; Forest Rights Act, 2006. Contrary to claims made by the respective governments, none of these laws has helped the Adivasis of Chhattisgarh, Jharkhand and Odisha affected by coal mining. Kusmunda coal mine in Korba, Chhattisgarh, is among the country's largest. One of the many villages affected by it is Amgaon. According to its Adivasi residents, SECL officials just came and put up the notice for land acquisition at the panchayat office, giving them little chance to oppose the move. This mine is spread over 2,382 hectares. Its annual coal production target was raised from 10 million tonnes to 15 million tonnes in 2009 and further to 18.75 million tonnes in 2014. Now it has again been raised to 26 million tonnes. Also Read: To expand coal mine, tribals want SECL to sacrifice goats. Will it? The expansion of Kusmunda mine in 2009 affected some 3,600 Adivasis of Risdi, Sonpuri, Padonia, Pali and Jatraj villages. They were informed about the acquisition of their land through newspapers even though most of them are illiterate. Those affected by the expansion in 2014 were told about it by SECL only after 752 hectares of land had already been acquired. On 20 July 2014, the coal ministry announced acquisition of 1,051 hectares of land in five villages - Amgaon, Churail, Khodri, Khairbawna and Gevra -- for further expansion of Kusmunda. The nearly 13,000 residents affected by the move were asked to file their objections and claims within 30 days. While most villagers never got the information, some landowners did file objections to the SECL, but to no avail. For Jharkhand's Tetrikhar mine, the ancestral land of the tribals was acquired without their consent as mandated by the law. To add insult to injury, much of the land lies unused. Tetrikhar mine is spread over 131 hectares. CCL wants to increase its annual production from 0.5 million tonnes to 2.5 million tonnes. If the plan goes through, about 6,400 Adivasis of Basia, Nagara, Jala, Pindakrom will lose their land. At Odisha's Vasundhara West mine, MCL is working to increase the annual coal production from 2.4 million tonnes to 8 million tonnes. MCL acquired about 860 hectares of land in Sardega, Tiklipara and Kulhapara for the mine in 1989-1990 under the Coal Bearing Areas (Acquisition and Development) Act, 1957. While mining is done on around 401 hectares, preparations are on to build a power plant on the remaining land. Local Gram Sabhas, however, are vehemently opposed to it, saying they will not allow the power plant to be constructed until MCL adheres to the Supreme Court guidelines and provides proper compensation and rehabilitation to the affected villagers. Despite such overwhelming evidence of apparent wrongdoing, the authorities remains in denial. Chhattisgarh Mining Secretary Subodh Singh claims that "no case of flouting of land acquisition law has been brought to my notice". "The government has not received any complaint in this regard. The state government follows all laws before acquiring land for coal mining. In fact, the Chhattisgarh government has adopted a policy of giving 2-4 times the cost of the land as compensation." TWEET THIS Coal mining is causing immense suffering to Adivasis in Chhattisgarh, Odisha. Why aren't we troubled? Chhattisgarh, Jharkhand, Odisha have 70% of India's coal. How does mining affect 2.60 crore Adivasis there?